VTAS (Visual Target Acquisition Set) is the first helmet-mounted sight system introduced for use with an operational fighter, the U.S. Navy F-4 Phantom II. Developed by the Honeywell Co. and adopted in March 1972, the system provides an arrangement that allows the pilot to aim the aircraft weapons system by looking at the target. The pilot wears an HGU-30/P helmet with a "Granny Glass" attached in front of his right eye. The glass provides a reticle display which is used to sight the target and aim the helmet and various componets of the weapons system. The VTAS I was replaced by the more advance VTAS II system in September 1975. 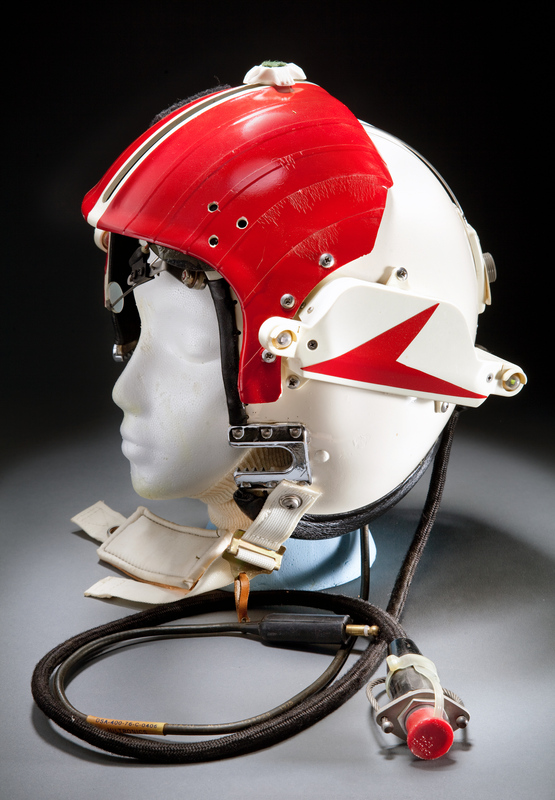 The Type A-13A oxygen mask is worn with this helmet. United States Navy Type HGU-30/P or VTAS I (Visual Target Acquistion Set 1) Protective Flying Helmet; white plastic protective shell with black leather padded lining; smoked visor with protective cover; red reflective tape on cover; velcro square on visor cover; adjustable "Granny Glass" sight mounted on top of helmet; side mounted Type R-1739/AVG-8 targeting system; plastic covered earphones with foam fill; black rubber covered microphone and earphone patch cord; red tape with silver letter text "BUILT BY THE PACEMAKER'S"; black nylon covered patch cord for sighting system; white nylon chin strap with leather and nylon pad and snap.